I’ve been missing you guys , so tonight I thought I’d drop in and say what was going to be, but turned into a not-so quick hello and let you know what’s been up! Warning: If this post feels condensed, it’s because my summer has been condensed! It’s been a hot and hectic summer around Casa AfroMartha. The kids are out of school with not very detailed summer camp plans, so that leaves yours truly with shuttling them around and finding activities to do. We’ve traveled quite a bit. The spring/summer started with The Hubs being sent on another business trip (those last a month at a time), leaving me with the kiddies all by my lonesome to juggle with my silly work schedule. He returned just in time for us to journey to Virginia Beach for my Stepson’s HS graduation. The Grad, Proud Papa and Siblings. I do not know the random dude on the right. 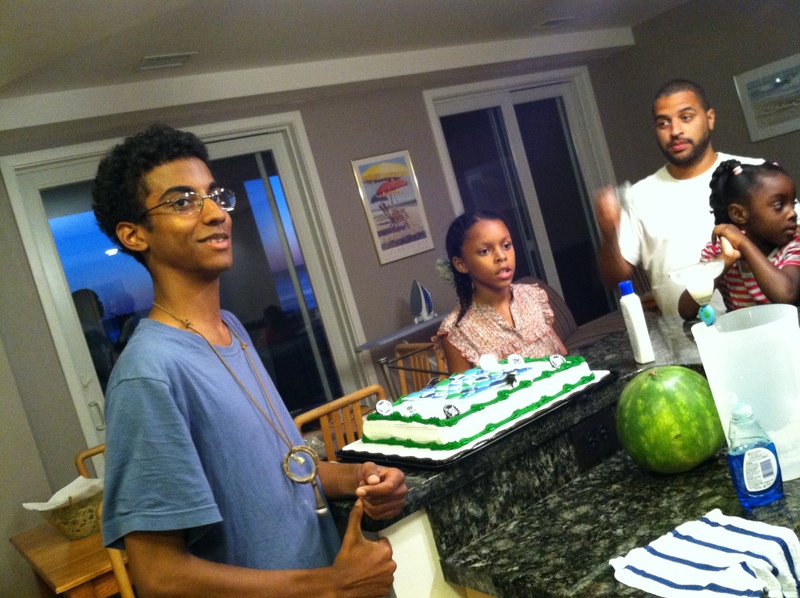 I can hardly believe I”m old enough to have a 6th grader, much less a fully grown adult Stepson. We had a wonderful trip, and it was so bittersweet to see this young man who has been through so much with his health in the past two years, walk across the stage and receive his diploma. One of the high points of the ceremony (for me)was when one of his wheelchair-bound fellow graduates walked across the stage to receive his diploma. 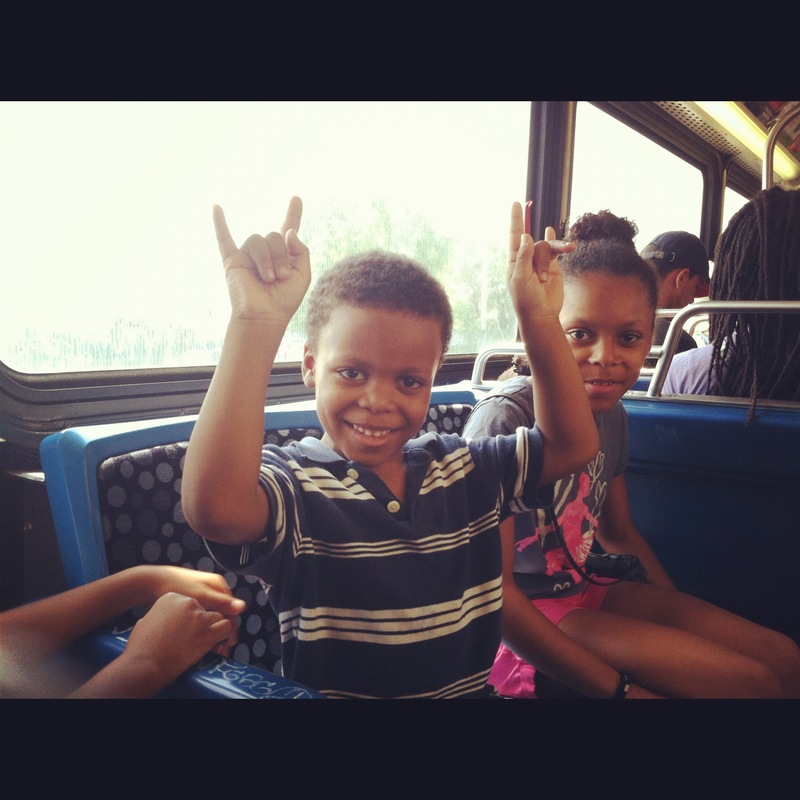 Everyone rose up to salute this young man. What made this extra special for the Rod clan? 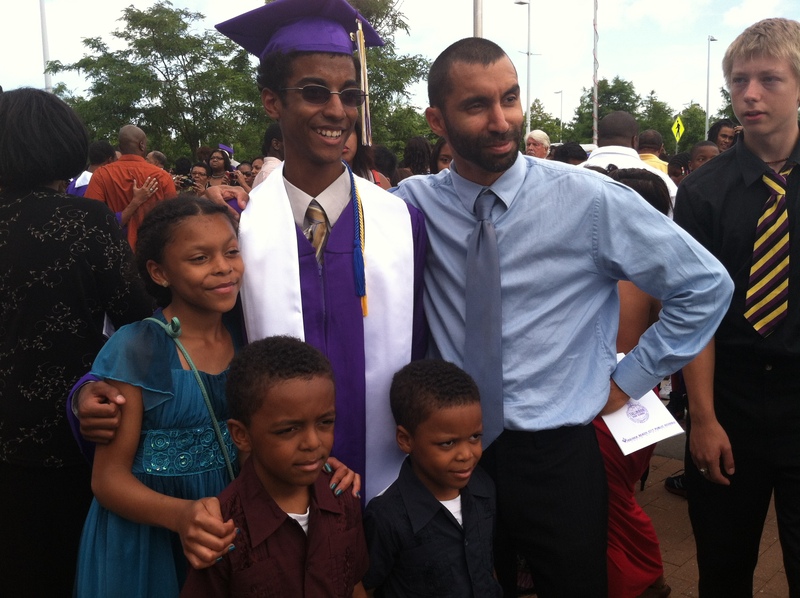 He had promised my Stepson that if he (my Stepson X) beat cancer, he would walk (instead of wheel) across the stage. There was not a dry eye in the Rod section of the crowd. I know, I know, no one knew he was sick. I usually don’t disclose personal family issues here. After all, this is supposed to be a blog about crafting/home improvement and such. Besides that, I’m also an intensely private person who does not believe in exploiting tugging at people’s heart strings with tales of woe. This trait is anti-thetical to being a blogger, as you have to be willing to open up your life at least a little. I also did not share about X’s illness because I felt that it wasn’t really my story to tell, but his mother’s. After all, we weren’t the ones in the trenches with him, in the day to day battle with Chemo. I felt so guilty about our inability to physically be there (though The Hubs traveled the 600miles to see him as often as he could). Thankfully his treatments went well and he is now cancer free. He also didn’t miss a beat and graduated on time, so we are very thankful. So, from X’s graduation on to the next adventure. My sweet In-laws departed Virginia Beach for NYC with my Princess Y, who spent the next 3 weeks with them in NYC. Of course she had a wonderful time being taken to all different venues such as the Bronx Zoo, biking in Times Square, all forms of H&M stores on 34th st, her weekend ‘job’ at a cute little children’s boutique, and just generally being spoiled rotten with shopping. If you ask her, she is now a seasoned New Yorker after just 3 weeks. 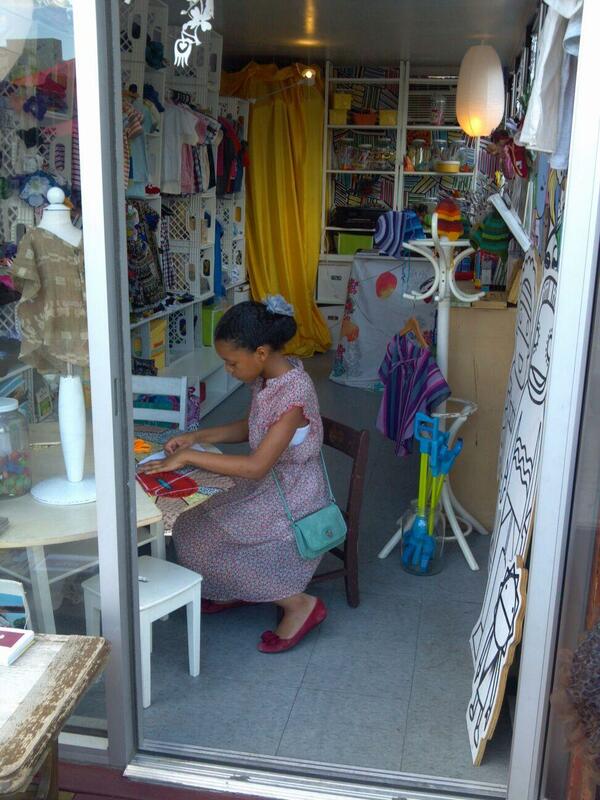 ShopGirl helping to cut out patterns at the boutique. Yes she styled herself. I am not that style-savvy. What goes up, must come down, so we had to make the drive to go pick her up 3 weeks later. (Why is it that NYC and Hampton Roads Virginia are the exact same distance from Dayton Ohio? Like, we couldn’t get a break on the mileage!) So we made a mini trip of it, spending 4th of July and DangerDude’s (my youngest son) birthday in NYC. We made sure to take him to not only Toys’R’Us, but also FAO Schwarz too! As is my tradition whenever I’m in the city, I made a stop to the fashion district. 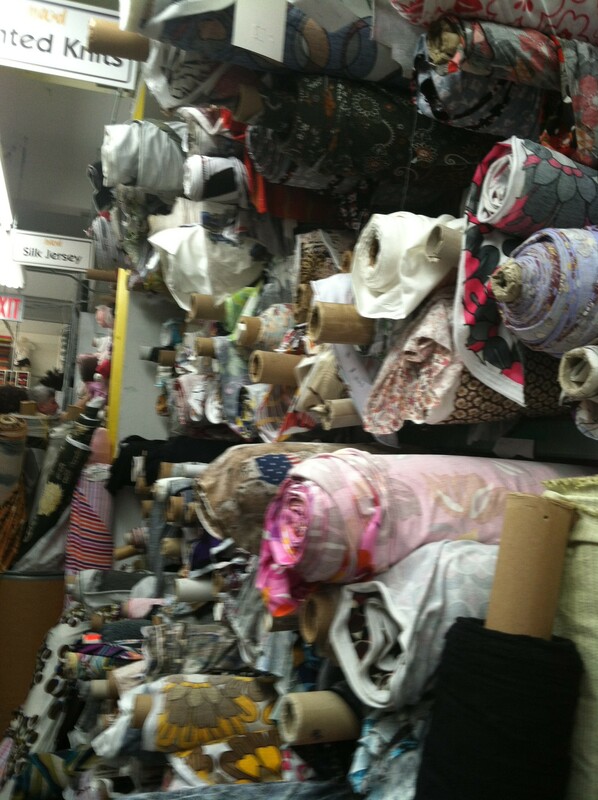 I visited some of the numerous bead stores on and around 5th ave, and of course I visited Mood Fabrics. I did not purchase anything on this trip due to the temporary moratorium that I’ve placed on my craft stash, but it was still fun to look. ooooh, look at all that fabric! Oh yea, out of the blue, my (elderly) father decided to move from Alaska and come live with us. To say the least, living with him has been educational. I am learning to get used to caring for him, who I haven’t lived with since my late teens. To say my Dad’s eccentric is putting it mildly. For the most part, having him around has been good. As The Hubs put it, it makes our family feel more complete. As if my life wasn’t complicated enough, I will be going back to school in the fall. I have decided to pursue a short term web development certificate that will buff up my design and web-building skills. I plan to keep posting here, but I may be MIA for short periods of time here and there. Believe it or not, I am looking forward to the fall. The kids return to school, giving the daily routine that sweet rhythm missing from those hazy, hot and humid summer days. In the meantime, I plan to enjoy living in the moment, and reminding myself as much as I can (in those moments when I am feeling overwhelmed) that this time is just a few pages of the big book that is our lives. How about you? I hope you’ve had a memorable summer! There is so much to say, but I simply can’t say it all. I enjoyed reading every single line of this post. I’m so happy for the good news of health (and yes, you mentioned it once before), graduation, birthdays, family, school, and everything else in between. I will definitely be keeping up via email for sure. Congrats, my friend to a fantastic whirlwind of a spring/summer! Love the pictures! Your kids are gorgeous 🙂 My summer’s been tough. Military motherhood isn’t something this hippie-witch mom was built for. It’s good to see you’re so busy with happy things. Thank you so much Shelly. Military Motherhood is hard for anyone, especially a ‘hippie-witch mom’ lol. Hang in there, I hope it gets better for you!